Agri loader buckets available in capacity from 1.9m3 to 2.6m3. Designed to fill various types of materials into bulk bags with ease. The Prodig Forklift Bag Filler Bucket is a unique attachment to utilise your forklift to pick up material, fill and move bulk bags which increases productivity and eliminates spillages. Designed to allow users to utilize their fork lift for use with a bucket. Our range of front end loader buckets are designed with efficiency and long working life in mind in the toughest environments. Hi-Tip Bucket available in a range of sizes from 0.85m3 up to 6.0 m3. Ideal for use with bulk materials such as grain, woodchips, compost, etc. Industrial loader shovel buckets available in capacity from 3.15m3 to 3.9m3. Designed for heavy duty use. Ideal attachment for Tractors and Loaders for safe loading and unloading. Designed with a low back for better vision and side access steps for safety. This range allows a Skid-Steer to easily load high side trailer. Manufactured with cranked 25mm Hardox tines which easily slide under stones in soil. Hydraulic grapples can be fitted to all of our GP range of Tele/Artic loader buckets. Ideal for efficient handling of maize, manure, recycling etc. on Wheel Loader or Tele-Handler. Telehandler Tine Grab from 1.8, 2.2 and 2.5 metres. Ideal for efficient handling of silage, maize, manure, bales etc. Hydraulic grapples can be fitted to all of our GPT range of Tractor loader buckets. Ideal for efficient handling of maize, beet, manure, recycling etc. on tractor loaders. Tractor Tine Grab from 1.3, 1.5 and 1.8 metres. 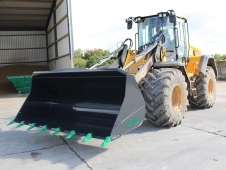 Ideal for efficient handling of silage, maize, manure, bales etc.